A few years ago, on a beach here in Cape Town, dozens of pilot whales, also known as false killer whales beached themselves. Hundreds of people tried to get them back into the water but the whales simply swam right back to the beach. The animals were clearly disoriented, exhausted and dehydrated. Finally after hours of trying to get them to go back into the ocean, the authorities euthanized them all with a bullet to the brain. 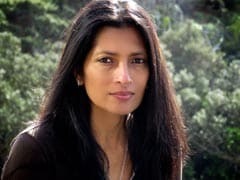 It was traumatic for those of us watching the actual stranding and seeing the whales just lying there on the beach, their glistening bodies cut up from dragging themselves over the rocks, their bodies slowly dying under their own weight, as their mass crushed their organs, without the water needed to make them buoyant. Then, hearing those gun shots. I can only imagine what the whales themselves were going through. So I feel for both the whales and the people in Tuticorin. There is something unbelievably tragic about witnessing these beautiful animals die. 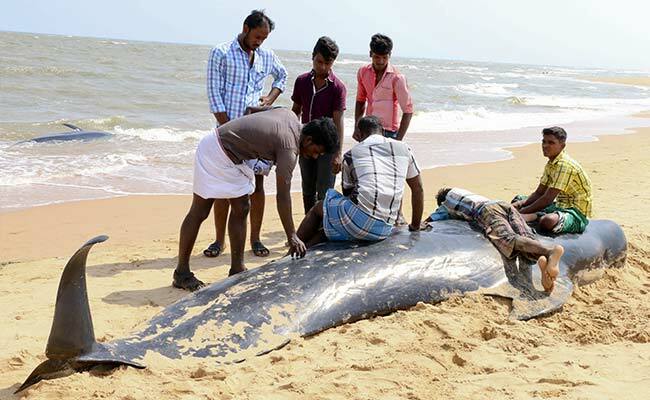 Fishermen in Tuticorin spent hours trying to rescue nearly 100 whales stranded on the beach. 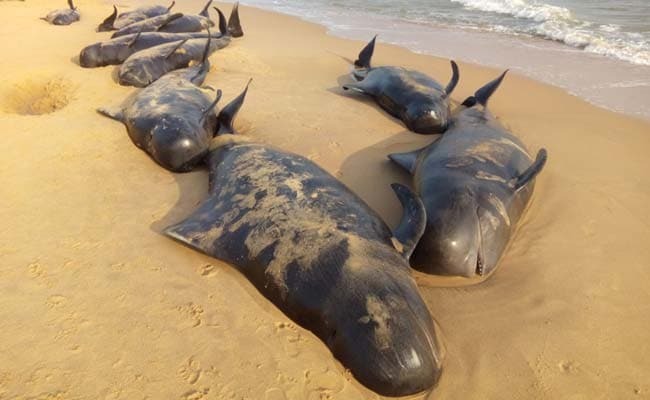 The short-finned pilot whales that beached in Tuticorin are dolphins that behave more like whales. They are usually found in deeper waters off shore and feed on fish, squid and crustaceans. These whales have teeth, unlike the baleen whales, who are filter feeders. Whales are slotted into those two categories broadly: the ones with teeth and the ones with filters. The blue whale that washed up on a beach in Maharashtra in June, 2015 is the largest baleen whale. While they are sea creatures, we must never forget that once, many moons of evolutionary cycles ago, these were creatures that lived on land. To this day, they need to breathe air and while their breath hold is impressive and they can dive deep, they need to keep coming up to the surface to breathe. They are also mammals. Like us, they are warm-blooded, their babies develop in their uteruses, they suckle their calves with milk and have very close social bonds. Pilot whales especially are known to swim and live in large pods. 50-80 animals in a pod is not uncommon. A pod is usually lead by an experienced female and made up mostly of females as well. Males usually leave their birth pod and join other pods to prevent inbreeding. Usually in a pod, there might be one mature male to 6-8 females. The pod of whales started beaching themselves on Monday afternoon along a 15-kilometre stretch of coast near Tiruchendur on India's southernmost tip. They have a varied and rich language with which they communicate to each other and different pods of the same species might have variations in language, developed for just that pod, indicating cultural sophistication. Whales are some of the most intelligent beings on this planet and their ability to love, share and care rivals that of any human society or family bond. I would go so far as to say they perhaps have even closer bonds than humans - if some members of their pod get sick or disoriented and beach, often the entire pod will swim after them to stay with them and even beach and die with them, although the rest might be healthy. Several hundred whales and dolphins strand and die every year. With all our advances in science and marine biology, we still struggle to understand exactly why although we have some broad information. Whales have been stranding for as long as there have been whales. It is not a new phenomenon. Toothed whales seem to beach more than baleen whales, as being mainly off shore feeders, they have no idea of coasts, sand bars and shallow waters, and once caught there, are unable to navigate properly. Officials suggest these whales may have ended up in Tuticorin after travelling thousands of kilometres from the Pacific. We see more of beaching today for two main reasons. One, there are that many more people on beaches and people look for strandings and two, what we are doing increasingly to the oceans results in this. 1) The whales get sick, old, injured and die in the ocean and wash up on the beach. This is usually how baleen whales are found on beaches. 2) They get disoriented by a massive shift in water pressure, due to an under sea earthquake or diving injury or a disturbance to the earth's magnetic field and take the path of least resistance, which is a downward current that leads to the beach. 3) Some members of the pod beach and others follow voluntarily. 1) The incessant polluting of the worlds waters leading to poisons and toxins in the water, killing whales or making them sick. 2) Collisions with all the boats and ships in the oceans. 3) Navy sonar exercises causing them extreme pain as these particular whales, that is the toothed whales, use their own inbuilt sonar system, which enables them to echo locate or bounce sound off objects to identify them. This helps them find prey and navigate. When there is a sudden change in pressure under water or a loud sound, it can cause heavy trauma and excruciating pain resulting in barotrauma, almost making them deaf from the damage for a while. 4) Over fishing of the world's waters, plus massive purse seine nets, some of them kilometres long in the ocean, trapping whales or preventing them from using their echo location accurately and from diving for food. Then starvation, leading to dehydration, disorienting them. 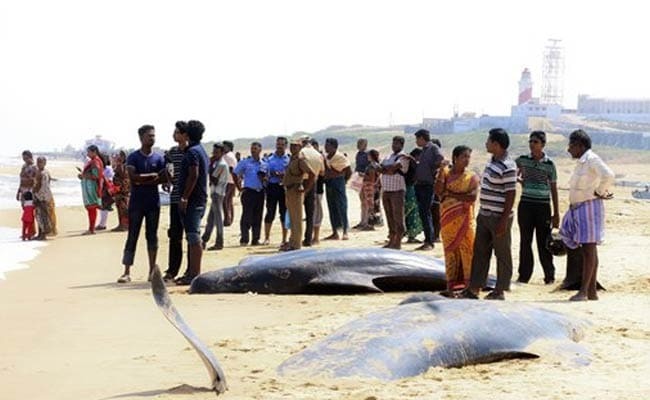 Unfortunately, with so many theories it's hard to pin point why these particular whales beached in Tuticorin. The port town is located on the Gulf of Mannar, one of the most bio-diverse marine habitats in the world, which also contains one of the first protected marine national parks ever established - The Mahatma Gandhi Marine National Park. Quick responses by the fishermen there helped rescue a few whales. Chances are, like in the Cape Town case, those whales might just swim until they beach further down the coast, their will to live usually eroded by the death of so many pod mates. On that stranding in Cape Town a few years ago, I remember feeling helpless, sad and frustrated that even the ones being pushed out to sea came back to die on the shore. Maybe they are trying to bring us a message - simple truths about the importance of love, bonds with family and friends, the need for a cleaner planet and the ultimate truth that death comes to all the living and that some things are a mystery.